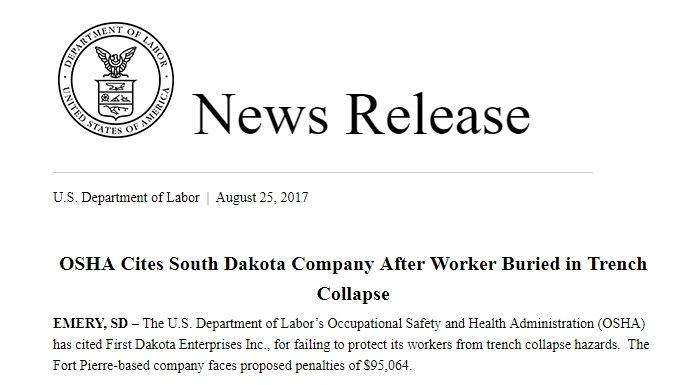 EMERY, SD – The U.S. Department of Labor’s Occupational Safety and Health Administration (OSHA) has cited First Dakota Enterprises Inc., for failing to protect its workers from trench collapse hazards. The Fort Pierre-based company faces proposed penalties of $95,064. On May 23, 2017, a 34-year-old worker was completely buried when the walls of a 14-foot trench collapsed around him. Co-workers quickly freed the victim’s head, which allowed him to breathe while emergency personnel worked for more than 30 minutes to free him. OSHA investigators determined that First Dakota Enterprises Inc., failed to use a trench protective system or conduct regular site inspections to correct potentially hazardous conditions. 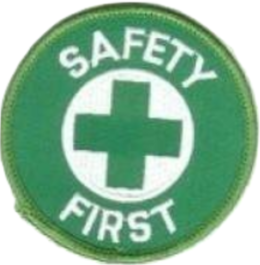 OSHA cited the company, which was contracted by the City of Emery to replace the city’s main sewer and water lines, for two repeat and one serious safety violations. Trench collapses are among the most dangerous hazards in the construction industry. As of June 1, 2017, 15 workers have died in trench collapses. In 2016, a total of 23 deaths occurred in trench and excavation operations. Trenching standards require protective systems on trenches deeper than 5 feet, and soil and other materials kept at least 2 feet from the edge of a trench. OSHA offers a wide range of resources and guidance information on its trenching and excavations page. Learn more about OSHA’s e-tool for safe excavation and trenching.